When developing products for the Heston from Waitrose range, we always try to introduce elements like fun and nostalgia to make them special and different. We have been looking at developing a celebration cake for several years now, but until the summer of 2017, we had not been able to create something unique enough to sit in the range. Then, while working closely with the Waitrose team, we came up with the Top Hat Cake, taking inspiration from Heston’s childhood memories. The cake is our first product for Waitrose Entertaining, the store’s made-to-order food service. ‘It’s delicious,’ says Rachel Aldridge, one of the supermarket’s bakery buyers. 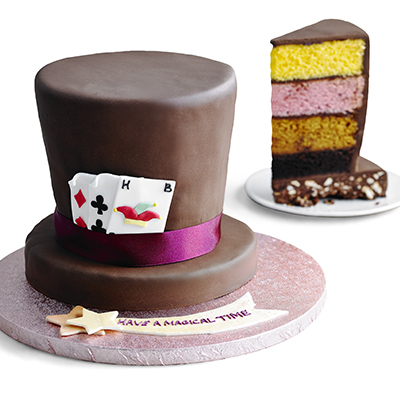 ‘The layers have real impact when you cut it – people will be delighted.’ The Top Hat Cake serves 20 to 30 people and can be personalised with a message of your choice. You can order online or from the welcome desk, and get it delivered to your home or collect it in stores.